Editor’s note: Tired of hauling heavy coolers and worrying about running out of ice, but hate the thought of not eating well on your outdoor adventures? Lacey Anderson has a solution for you – lightweight, nutritious meals that require no refrigeration. Here’s a tale of her outfitting a 10-person group for an eight-day trip. It all started in June when I was informed that my name was “recommended” to a fellow kayaker. Apparently he got word that this guy was looking for rafters to join his permit after being referred by another boater. 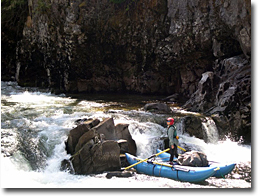 So, I contacted the guy and he was indeed looking for rafters to join in on his small flotilla of inflatable kayaks for a late-July Middle Fork Salmon trip. Of course, we were interested in joining him, but we are not “rafters” in the conventional sense. This is because we both run lightweight, small, solo cats and prefer to take as little gear (i.e., weight) as possible. Since he was used to running overnights in an IK or canoe, he was fine with this and we became the first rafters to sign on. I volunteered to put the food together for the group which was much appreciated by all. Since this was going to be a low-water trip (expected around two feet on the gauge), light boats would be advantageous. I have developed a menu that is nutritious, good tasting and easy to prepare, that is also lightweight and does not require refrigeration. Being used to his normal river food being peanut butter sandwiches, simple freeze-dried packets and oatmeal, our trip leader liked my lightweight, nonperishable menu and his wife was glad someone else was putting all the food together. Going light like this takes a lot of planning, energy and time to get everything together, but I was experienced with this type of trip, having led many commercial backpacking and rafting trips. Imagine, eight days on the river with no big, heavy coolers (NO ICE). Awesome! At the put-in, I helped divide up the food between boats. One raft carried the entire kitchen and everyone carried at least one small/medium dry bag of food. It was pretty easy because every meal was pre-packaged separately so that they could be divided up equally. A master list of who had what meal helped keep track of where each day’s food was. I also provided a complete menu and preparation instructions for each meal. So easy, even a caveman could do it. The IKs were awesome, each carrying their own personal gear behind them in a large dry bag and a small/medium bag of food up front. The raft and cats, of course, carried a bit more weight. I had some fresh food in small soft coolers (no ice) on the cat in addition to a few dry bags of food. The soft coolers were handy for the beer pick up at Flying B. Everyone had a fantastic time and were amazed at the quality of the food. I have just published the second in a series of cookbooks. 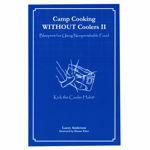 The most recent “Camp Cooking WITHOUT Coolers II” contains a seven-day meal plan using nonperishable foods. 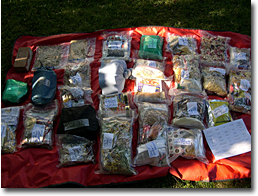 In addition, I write about how to pack, what type of kitchen equipment to take and have included a chapter on eco-friendly low-impact camping. Check out my blog where you can find some tips and tricks for packing with nonperishable and semi-perishable foods - www.nocoolers.com.